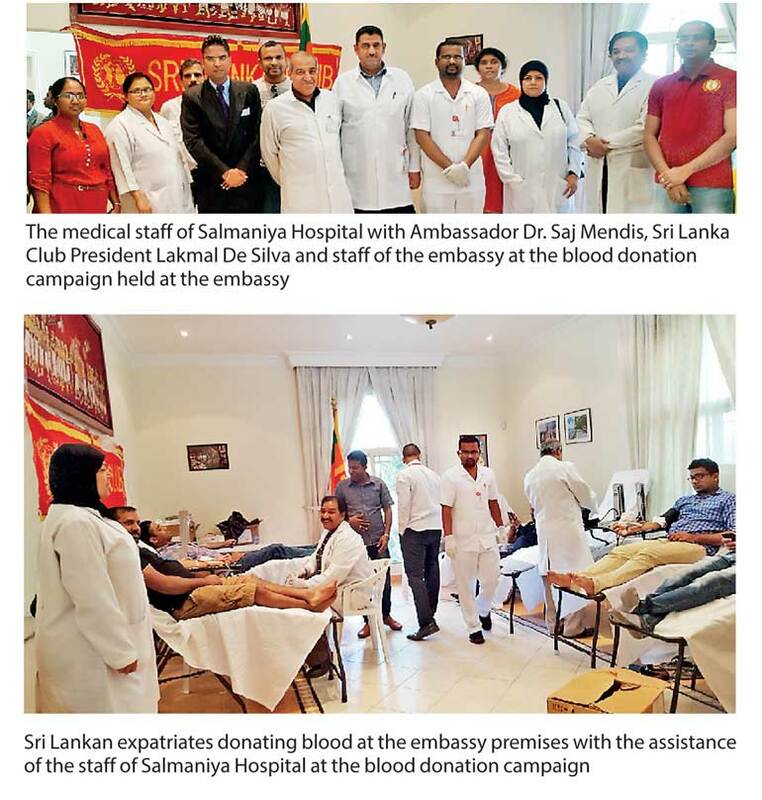 The Embassy of Sri Lanka in Bahrain, in collaboration with the Sri Lanka Club, conducted a major blood donation campaign with the cooperation of Salmaniya Hospital in Bahrain. Ambassador of Sri Lanka to Bahrain, Dr. A. Saj U. Mendis, stated that well over 150 Sri Lankan nationals domiciled in Bahrain donated blood at this campaign, jointly organised by the Embassy and Sri Lanka Club, as one of the many events to commemorate and celebrate the iconic ‘Sri Lanka @ 70’ independence celebration. The Sri Lanka Club is the only registered and legalised Sri Lanka Club in Bahrain. President of the Club, Lakmal De Silva, told the Bahraini media that the blood donation campaign was conducted by the Sri Lanka Club for a number of years and on this particular occasion it was held on a grand scale to coincide with the 70th independence celebrations of Sri Lanka. The blood donation campaign was held at the embassy premises and the staff of the embassy, members of the Sri Lanka Club, well-wishers and Salmaniya Hospital assisted this campaign. The embassy and Sri Lanka Club chose a Friday since it was a holiday and most of the Sri Lankans would be able to participate in the blood donation campaign. The Salmaniya Hospital, a premier state-of-the-art hospital, detailed senior medical staff including doctors, nurses and medical assistants to conduct the blood donation campaign. The embassy and sponsors provided an assortment of refreshments, particularly for the Sri Lankans who had donated blood. The campaign began at around 8.00 a.m. and was to conclude at 12.00 noon but the time was extended until about 1.30 p.m. since many Sri Lankans arrived to donate blood even after 12.00 noon. Ambassador Mendis said that initiatives such as the blood donation campaign to commemorate the Sri Lanka @ 70 independence celebration would elevate bilateral relations between the two countries. The senior management and staff of Salmaniya Hospital also deeply appreciated the gesture of the Sri Lankans working and living in Bahrain. It was unique to note that a number of Sri Lankans, both employed and unemployed, including housewives, parents, children and relatives of expatriate Sri Lankans keenly participated in this blood donation campaign. Ambassador Mendis, together with Sri Lanka Club President Lakmal De Silva, expressed his gratitude to all those who donated blood largely for the benefit of the people of Bahrain.